Do you travel internationally? If so, do you want to know how to make it easier? We’ve put together a list of 8 tips you can use to make international travel as effortless as possible. Sometimes, traveling abroad is quite simple. Depending on where you’re going, you may not experience things being done much differently than at home. But, there are many places you’ll travel to that have a whole different set of rules. And, almost any time you visit another country; there are certain protocols that you must attend to. To make sure you’re always ready for international travel, keep your passport up to date. We admit the expiration dates on passports can be a little confusing. The United States allows you to use your passport up until the date you see on the inside cover. Some countries, however, won’t let you enter if your passport is set to expire in less than 6 months. To avoid any complications, or cancellation of plans, update your passport approximately 9 months before the expiration date. If you take prescription medication, or need a certain remedy once in a while, make sure you pack a lot of it. When you get to your international destination, there’s a very good chance you won’t be able to get any of your normal medicines. You want to be in a position where there could be an emergency and you still have enough medication to get you through a week, or longer. If you’re visiting a third-world country, you may want to consider having your doctor prescribe the antibiotic ciprofloxacin before you leave. As you plant to set off on your international trip, read up on any travel warnings and advisories that your local or national government may have issued. You want to be sure that you know where you’re heading to is safe. It’s also a great idea to print out the contact information and address for your local embassy in the country you’re traveling to. Keep a copy on you and in your hotel room. When you’re in another country, there’s a good chance you’ll be using a credit card. And, you don’t want to have your card blocked by the issuing company because they think it’s being used by someone else fraudulently. Let your credit card company know what countries you’ll visiting, and on what dates. Also tell them the places you might have a layover in. If you make this one quick phone call, you can save yourself a lot of time trying to get your card activated after it’s been shut off. If you have a credit card, use it during international travel. You’ll often get the best currency exchange rates. But, beware of transaction fees. Some credit cards waive these fees, but it’s a good idea to check first. Two of the top travel credit cards, the Platinum American Express and Chase Sapphire Preferred cards, are favorites with international travelers because they don’t charge these useless fees. Also, if given the choice, opt out of converting charges into dollars at hotels, restaurants, or other places. You’ll lose money for sure. When you’re in a foreign country, the first thing you should do when you arrive at your hotel is grab a business card from the front desk. Keep it with you as you travel around, so that you can show it to anyone if you need help getting back to your hotel. Even though many people in other countries speak English, they may not understand you well enough to guide you in the right direction. Having something with an address in the local language is preferred. Make sure your cell phone is set up to accept international data roaming. If it’s not, you’ll incur huge fees when you make calls out of the country, or even within it. Usually, it’s best not to print and waste paper when we can get information otherwise. In many of our home countries, it’s preferable to use Google Maps on a smartphone or iPad to get where we’re going. But, in a foreign country, you don’t know what cell service or Wi-Fi will be like. You may not be able to connect anywhere, or it may cost quite a bit. 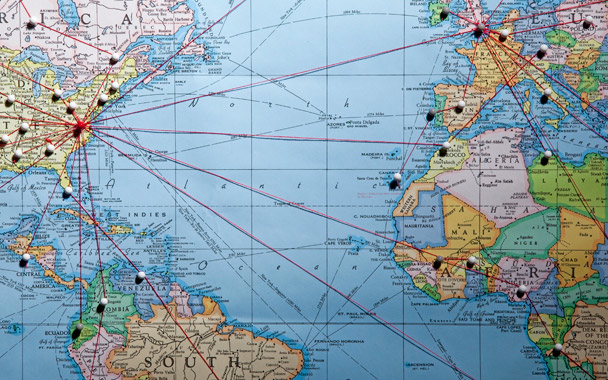 Before you leave for your international trip, print out maps to places you know you’ll visit. Also, if your hotel has Wi-Fi, use it to print out any maps or information you’ve realized you’ll need. These are just a few of the tips we have for making international travel safer and easier. There are many more, but begin with these and you’ll be off to a good start. Which Airlines Offer the Healthiest Airplane Food?